Gloucester Massachusetts is a city on Cape Ann and is part of the Massachusetts North Shore made of small waterfront neighborhoods such as Rockport and Annisquam. A pleasant ride at about thirty-one miles to the Northeast of Boston, surrounded by Essex, Ipswich and Manchester-By-The-Sea, Gloucester is a very popular summer destination. Gloucester is home to America's original seaport and also boasts of the oldest working art colony in North America. The beauty of this picturesque waterfront and bountiful waters has drawn artists and fishermen for hundreds of years. 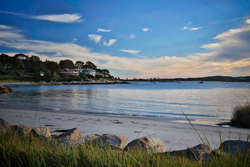 With its sandy beaches, rocky landscape, luscious greenery, hemlock woods and wild estuaries full of shorebirds, Gloucester is not only a place to see, it is a great place to live. In Gloucester you can enjoy a variety of things such as live music, art, culture and entertainment year round or deep sea fishing, whale watching and sun bathing on one of the many beaches. Visit one of the lighthouses dating back to the 1700's, shop historic downtown or visit the Town Green, The Museum or The White-Ellery House now owned by the museum. Gloucester, or Gloucester by the Sea as it is often called, is the center of the fishing industry and also played an important role in ship building in the 1700's with the first schooner ever built. The schooners were used for large fishing expeditions which brought in hoards of cod and haddock for the settlers. The abundance of fish available in this location prompted the famous Gorton-Pew Fishery of the 1800's, a seafood business now known as "Gorton's of Gloucester" and is known throughout the country for its product. In addition to being the center of the fishing industry for provisionary purposes, Gloucester is also a center for fish research. Gloucester's urban core lies to the north side of the harbor and the outlying area is made up of beaches, coves, parks and forest. The Western Harbor is home to the fisherman's memorial, and the inner harbor is home to the fisherman's fleet. Gloucester also offers private and public schools. The public school system has five elementary schools, one middle school and one comprehensive high school. The private system is made up of private and Catholic schools providing pre-kindergarten, kindergarten, elementary and middle grades.